Why not extend the Purple Line to Largo in Prince George's County? Image by Elvert Barnes licensed under Creative Commons. This article is part of a series focusing on circumferential transit in the Washington region. It was also published by the DC Policy Center. Read Part 1, Part 2, and Part 3. 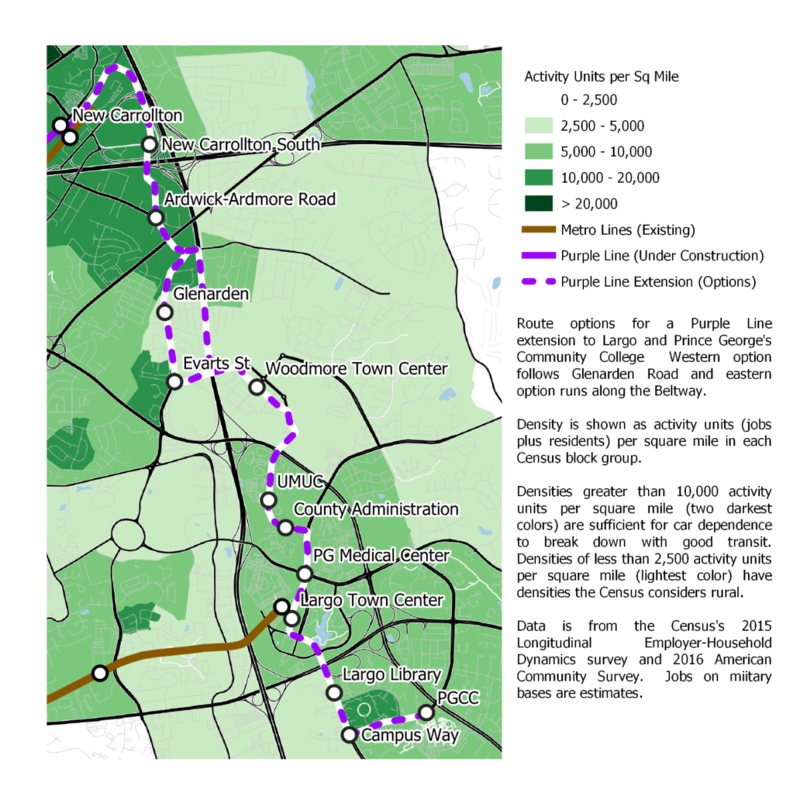 While the idea of a Purple Line extension to Tysons Corner garners a lot of excitement among transit advocates and political leaders in the region, those in Prince George's County tend to favor an extension south from New Carrollton to serve Largo and National Harbor. This would better connect the densest parts of the county to the new "downtown" under construction in Largo. Although Largo is currently quite auto-centric, the county is working on creating a more walkable street grid. Transit service to this area is becoming increasingly important; a new Prince George's Medical Center is currently under construction and many county government functions are relocating there from Upper Marlboro. An extension to Largo and Prince George's Community College would be relatively short—about six miles—and would serve rapidly growing areas with poor transit connectivity. Beginning to plan such an extension now would have an important advantage: it would be planned alongside the new development coming to the area rather than being retrofitting later, as was done with the Silver Line through the edge city Tysons Corner. Any plan to extend the Purple Line south must first address the fact that the line currently under construction terminates inside the Beltway, north of (and parallel to) the Amtrak Northeast Corridor. Given the site geometry in New Carrollton, the most practical way to cross these obstacles is with a series of bridges. 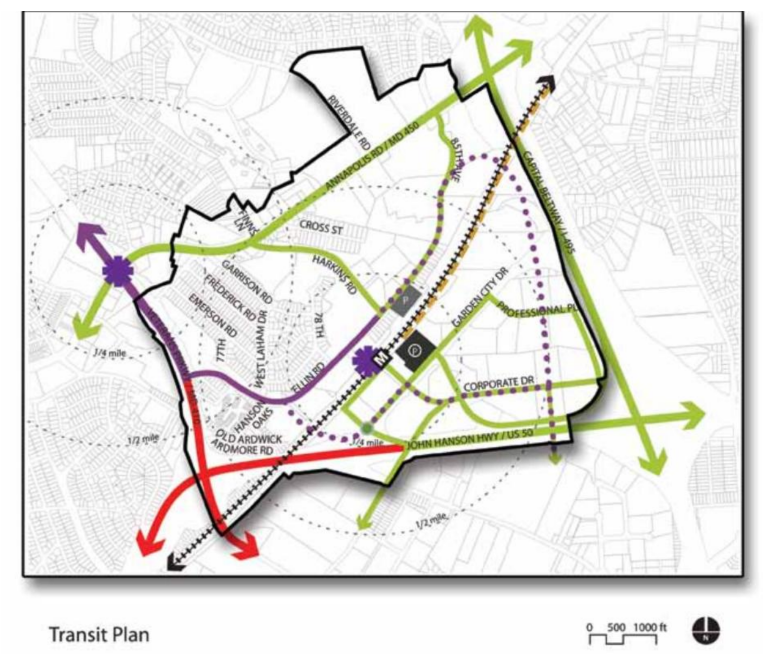 The New Carrollton Transit District Development Plan, published by the M-NCPPC in 2010, includes suggestions of potential Purple Line extension alignments crossing over the Northeast Corridor on a bridge either just west of or just east of the New Carrollton station. This map from the 2010 plan shows the Purple Line as solid purple, with potential extension paths across Amtrak's Northeast Corridor railroad tracks shown in dotted purple. New Carrollton station is the black and white "M" next to the purple asterisk. Image by M-NCPPC. Either plan would allow for an additional station serving the eastern portion of the triangle formed by the Northeast Corridor, US-50, and the Beltway. While this area is largely a sea of parking today, it is set to become much denser, with mixed-use residential, retail, and office spaces, as part of ongoing redevelopment around the New Carrollton Metro station. A second bridge would be required to cross US-50, and a third to cross the Beltway, before reaching the Woodmore Towne Center development just northeast of the intersection of Landover Road and the Beltway. Running in the median or on the side of the Beltway ROW here might be a way to avoid grade crossings or running in mixed-traffic, both of which lead to reduced speeds. Whether the line to Largo runs along Brightseat Road or the Beltway south of US-50, it will need to end up outside the Beltway in the vicinity of Woodmore Towne Centre. In the case of a Brightseat Road alignment, a bridge in the vicinity of Evarts Road would provide the most convenient Beltway crossing. Either way, it could continue along Ruby Lockhart Boulevard and St. Josephs Drive running in medians or, if necessary, in mixed traffic. A 3.5-mile routing along McCormick Drive, Lottsford Road, Harry S. Truman Drive, and Campus Way South would allow the line to serve the University of Maryland University College academic center, the new Prince George's County administrative buildings along McCormick Drive, the new hospital being built at the intersection of Lottsford Road and Arena Drive, the Largo Town Center Metro station, and Prince George's Community College. Even if the alignment were settled, questions remain. How many stops should there be? Less frequent stops would speed trips, but more frequent ones might be justifiable to serve the somewhat spread-out destinations in the area. Spacing the stops more closely together is also more justifiable near the end of a line, since there won’t be passengers riding through the area to be inconvenienced by them. A more walkable street grid could also reduce the number of stops needed: part of the reason that the Silver Line has four stops in Tysons Corner is that the Beltway, VA-123, and VA-7 create major barriers for pedestrians. Should the Purple Line go all the way to National Harbor? Suggestions for extending the Purple Line in Prince George’s County usually mention National Harbor as a destination. This seems to make sense, since—despite not being well-served by transit—National Harbor is a dense, mixed-use development with a significant number of jobs and residences, and a number of destinations for non-commute trips. However, a Purple Line extension along the Beltway from Largo is not the best way to serve National Harbor. To continue further along the Beltway from Prince George’s Community College, the Purple Line would need to nearly reverse direction. It would then run through a very low-density part of the county. The area outside the Beltway between PGCC and Branch Avenue—other than Andrew’s Air Force Base—has rural-level densities. That combined with the base’s security perimeter means that serving people commuting there probably would not be practical. In addition, a line running from Prince George’s Community College to National Harbor would be roughly 13.5 miles long. That's nearly the length of the currently-under-construction Purple Line, but serving far fewer riders. Still, part of the benefit of the Purple Line is connecting other lines, not just directly serving destinations along the Purple Line itself. However, the only major network connectivity benefit of a National Harbor extension would be the Green Line transfer at Branch Avenue. Even if the line continued across the Wilson Bridge to Alexandria, it's unclear that it would provide a faster travel time than taking Metro from Largo to Alexandria. It's a long extension to connect few good targets. Rather than serving the low-density areas between Prince George’s Community College and National Harbor via Purple Line, it would be much more effective to build a shorter line connecting National Harbor directly to a nearby Metro station via a route inside the Beltway. This is particularly the case since the Green Line already provides a relatively direct transit connection between the northern part of Prince George’s County and Metro stations fairly near National Harbor. While National Harbor needs a light rail or Bus Rapid Transit connection to Metro, connecting it to northern Prince George’s County directly via these slower-than-Metro forms of transit doesn’t make much sense. Although the full extension to National Harbor is probably not practical, the shorter extension to Largo should be built. Today the Largo area has just about enough density for transit, with about 8,000 jobs and residents per square mile. However, these numbers will increase with planned redevelopment, and Prince George's Community College has roughly 40,000 students on a fairly compact campus. Likewise, the new medical center will not only bring many new jobs to the area but also an inflow of patients, many of whom are coming from eastern Montgomery and northern Prince George's County. While ridership will likely not be as high—at least initially—as on the currently-under-construction Purple Line, if the growth plans for the Largo area are achieved, such an extension should be successful. In 2016, construction costs for the Purple Line were estimated at $2.4 billion. An extension to Largo would be about a third as long, suggesting that construction costs of $800 million might be reasonable: a very good deal for such a line. It's worth noting that while the necessary bridges over the Northeast Corridor, Beltway, and US-50 would likely mean a larger fraction of this extension will need to be elevated, the route lacks the steep inclines that requiring tunneling for the Long Branch section of the Purple Line. Right-of-way acquisition costs are hard to estimate, but it seems likely that much of the route would be running on public streets and publicly-owned land. In my next post, I’ll discuss other suburb-to-suburb transit connections that should be considered as complements to, rather than extensions of, the Purple Line.